The Month of May Celebrates Older Americans Who Are Aging Out Loud. Every year in May, Chicago celebrates “Older Americans Month” since 1963 to acknowledge and recognize senior citizens, their life experiences, and their achievements. As people get older every year, life changes with perceptions of time, lifestyles, age, occupation, demographics, logistics, health, fitness, and choices made during a life time. 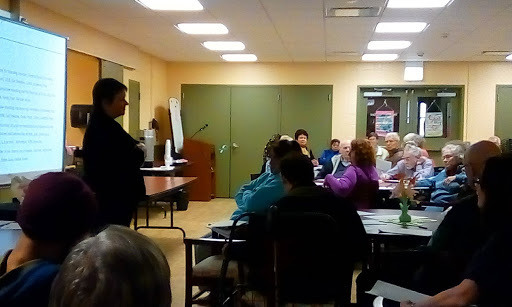 There are life enrichment programs for Chicagoans who are now 60 years and older. Senior centers provide facilities, amenities, and programs for those who are willing to explore renewed interests, goals, and life-long dreams during a new or second chance in life. The process of aging gracefully now involves re-defining old age by a different generation of “baby boomers” who are actually discarding clichés and outdated perceptions about old people and experiencing life with more freedom to live the way they want to live. Now in the Spring 2017, seniors can actually “Age Out Loud” and express by their example how they are living their lives as they are getting older in the new millennium. A passion for life is a new motto for the elderly who are willing to take up the challenge of “Aging Out Loud” with courage, determination, and peer group support. The other day, I called the Social Security Administration office to find out what the current retirement age is for employees in the United States of America. After waiting 24 minutes on the telephone line, a real person answered my question by stating that a person can retire at the age of 62 years old now. In 1997, the official retirement age was 65 years old. Some people choose to have an early retirement and others choose to remain working past retirement age in the USA. We are excited to celebrate Older Americans Month in May 2017 when “we age out loud” at the local City of Chicago DFSS senior centers near you. Gardenia C. Hung, M.A., B.A.